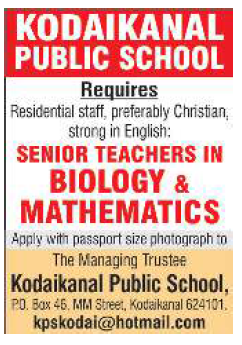 Kodaikanal Public School, Kodaikanal has advertised in THE HINDU for the recruitment of Senior Teachers jobs vacancies. Interested and eligible job aspirants are requested to apply by earliest. Check out further more details below. About School: Kodaikanal Public School - a Christian, Co-educational, Residential School set amidst lush pear orchards in the beautiful mountains of Kodaikanal in South India. It is one of the premier schools of India and has played an important role in shaping the lives of many young individuals.